Instead of finding yourself inside a bus with 50 strangers wearing headsets, Peregrine wants you to experience the world in an intimate and memorable setting. By providing hand-picked accommodation, exceptional local guides and a slower pace, they make quality adventures a whole lot easier to find. What better way to learn about your surroundings than by interacting with someone who lives there? Smaller groups mean more time to ask questions and less time waiting to check into hotels and more time taking in the sights and sounds. The hardest thing about travel is deciding where in the world to go. Do you read, research, ask your family, friends or go directly to your travel agent? The second hardest is deciding who to go with, especially if you’re dipping your toe into the water of group travel. There are so many companies out there, all singing different songs about what they can offer you – things can get pretty loud, and it can be tough to make an informed decision. Our friends at Peregrine have been in the small group travel game for nearly 30 years, and are experts at providing passengers with premium travel experiences that really embrace the spirit of adventure. They offer immersive experiences in over 80 countries around the world. Why travel if not for the experience? To meet people, see things and do things that you can’t see and meet and do at home? Peregrine start with the highlights – a walk along a section of China’s Great Wall, or a tour of Moscow’s Red Square – but when the bigger tour groups hop back on their coach, Peregrine’s local guides will help you find a more unique, personal experience, like discovering that little hole-in-the-wall restaurant in Rome, or sharing campfire stories with Botswana’s Ghanzi bushmen. 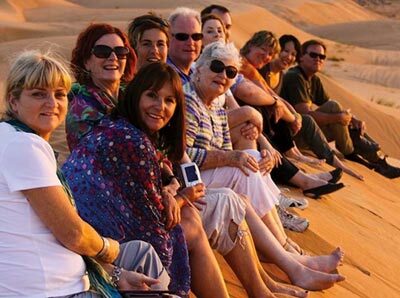 Unlike some of the bigger adventure tour companies, Peregrine tours travel with, on average, just ten passengers (when they say ‘small group travel’, they really mean it!). A smaller group size means more personal and attentive service from your guide, more time with your fellow travellers to make lasting friendships (it’s hard to form a connections on a coach with 45 other passengers) and opportunities to explore places off limits to the larger tour groups, like that tiny ramen joint in Kyoto or little Parisian patisserie. Ever wanted to spend the night in a 15th-century fortified palace in India? Or wake up to the sounds of monkeys, toucans and macaws in an Amazonian eco-lodge? What about falling asleep under a canopy of stars in the middle of Jordan’s Wadi Rum (in a luxurious tent, of course!)? Peregrine’s varied accommodation – from comfortable hotels to homestays to glamping – is hand-picked by their destination experts for its quality, amenities, character and convenience. Their smaller group travel size means passengers can stay in smaller, more unique accommodation, and bypass the big chains (and big queues at the breakfast bar in the morning). What’s the best way to truly get to the heart of a destination? Peregrine learnt long ago that the best people to show you the lay of the land are the people who live there, which is why they pioneered the concept of employing local guides. Want to know the secrets of Tibetan Buddhism, or where to find the best gozleme in Turkey? Peregrine’s guides (and their local connections) almost always have the answer. Some subscribe to the theory that if travel is comfortable, it’s not adventurous. But not Peregrine. Rather than spending the lead-up to your next big trip organising logistics, researching and booking accommodation, and trying to find that authentic (and delicious) local restaurant, let Peregrine remove all the hassles and uncertainties. From your initial enquiry until your final farewell dinner, you’re in good hands. As well as arranging quality accommodation and providing expert local guides, the cost of a Peregrine trip also covers sightseeing and entrance costs, transport, gratuities, many meals, additional specialist guides and porters (when needed), airport arrival transfers on most itineraries and 24-hour emergency support. So all you need to do is relax and enjoy yourself! Peregrine provide premium adventures in over 80 destinations around the globe; we bet they’ve got an adventure for you. Make your way from Santiago to Buenos Aires indulging in fine wines and meals. An ancient land formerly known as Burma, Myanmar is a nation of more than 100 ethnic groups. Take in Casablanca, Fes, the Sahara and Marrakech on this memorable Moroccan trip. Ancient cities, floating islands, mysterious desert inscriptions — Peru's natural and manmade wonders delight. Explore the Goreme's Open Air Museum, the ruins of Ephesus and hot springs of Pamukkale and everything else Turkey has to offer. What's it like to travel with Peregrine?